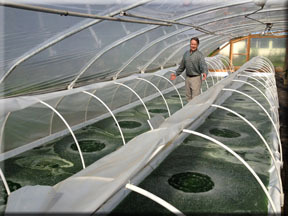 As one of the northern most spirulina farms in operation today, this facility will demonstrate the capability of algae microfarms in cooler climates and test practical and affordable microfarms and photobioreactors for growing algae for local food and high value products in urban, community, rooftop, mobile and vertical gardens. Two 55′ ponds have insulating foam panels below and retractable cover above, all within a larger vegetable greenhouse. This greenhouse and pond design will help keep algae culture water warm, increase productivity and extend the growing season beyond the summer months. See slideshow. This smart microfarm is monitored remotely by webcam and daily data sent from the local operator. 1. Harvesting through a microscreen. 2. Algae paste collected on the screen. 3. After pressing, spirulina is thick like a wheel of brie cheese. Extruded into noodles on dehydrator screens.